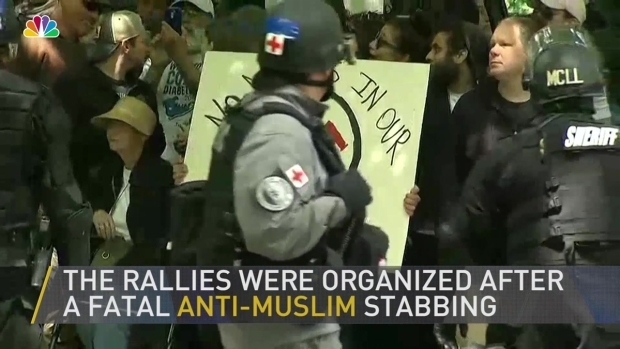 Demonstrators at small but raucous gatherings around the country Saturday raised the specter that extremist interpretations of Islamic law might somehow spread across the U.S., but many of the rallies drew even more boisterous counter-protests by people who called such fears unfounded. Hundreds of counter-protesters marched through downtown Seattle, banging drums, cymbals and cowbells behind a large sign saying "Seattle stands with our Muslim neighbors." Participants chanted "No hate, no fear, Muslims are welcome here" on their way to City Hall, where dozens of anti-Shariah protesters rallied. A phalanx of bicycle police officers kept the sides separated during the sanctioned events, but authorities said a large fight broke out after the gatherings concluded. Police used tear gas to disperse rowdy demonstrators and arrested three people for obstructing law enforcement. "I don't believe Islam can peacefully co-exist with the Constitution," said Seattle anti-Shariah demonstrator Aaron Bassford, 29. "We need unity in this country under no ideology and no banner except the Constitution of the United States of America." But the overwhelming majority of Muslims don't want to replace U.S. law with Islamic law, known as Shariah, and only "radical extremist groups" would call for that, said Liyakat Takim, a professor of Islamic studies at McMaster University in the Canadian city of Hamilton, Ontario. Dueling pro-Donald Trump and anti-Trump rallies in Portland, Oregon, attracted thousands of protesters Sunday June 4, 2017. Shariah, Takim said, refers to guidelines or principles — how Muslims should live. "Fiqh" refers to jurisprudence, or specific laws. The values embedded in Shariah do not change and are shared among Muslims, he said, while fiqh is open to interpretation and change, and in fact differs among Islamic sects and communities. "The Quran allows slavery. So does the Old Testament. That doesn't mean we allow it today, too," Takim said. "Laws are amenable to change." "There's an anti-Trump, a pro-Trump, anti-extremists, so there are a variety of messages here," San Bernardino police spokeswoman Eileen Hards said. "There are so many messages going on that I'm not sure who's who." "We're anti-Shariah. We're anti-radicals," the Upland woman said. She added, of Shariah: "It's coming in very slowly, and a lot of the refugees are bringing that ideology here. All of it is just barbaric." About 300 people attended San Bernardino's rallies. Three were arrested on suspicion of vandalism for smashing windows of two cars, Hards said.